The quantities here produce approximately 2 large smoothies. 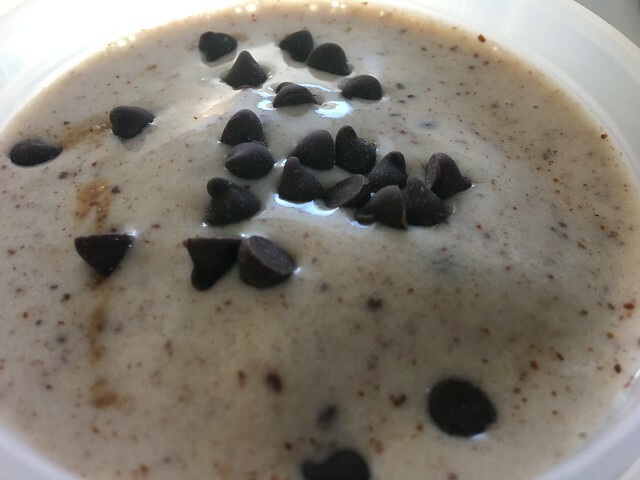 Add all ingredients except for one tablespoon of chocolate chips/chunks to a blender. Use just enough almond milk to cover the ingredients. Less almond milk will produce a soft ice cream consistency, while more milk will create a milkshake-like consistency. Once blended and transferred to cups or glasses, sprinkle some chocolate chips on top as a garnish. Enjoy! If you want to reduce the sugar, you can use cocoa instead of chocolate chips and add cocoa nibs in too.